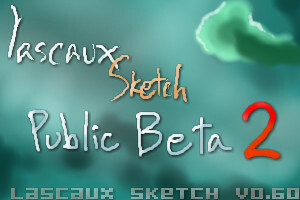 After two weeks of the first public beta, I decided to open up the suggestion box with public beta 2. + Fixed a bug when using tablet opacity with blend tool. + New improved table pressure opacity handling on solid brushes. + New Blend feature, that mixes colors on the canvas with the color in your brush. + Fixed bug with spacing in angled brushes. + Fixed bug with popup text dialog when switching between floating/docked mode. + Fixed bug with progress bar popups not disappearing sometimes. + Side note: anti-aliased support is gonna be replaced sometime in the future. A few methods were experimented with in this version, but unreleased. So, if there are features you'd like to see added during this stage of public beta testing, now is the time to make your voice heard! gotta add in the smudge tool i say, it can't be that horrid. I noticed that the tool buttons don't correspond to that of Photoshop ... may want to do it, since most people use Photoshop? I'm compleatly new to the application myself, tho I've used Oekaki and paint BBS just a bit a few times before. so if these are in there, I've just overlooked them, and I'm sorry for wasting space here. and much more importantly, a space->drag hot key combination to move around the canvas (like a 'quick scroll' feature in PS) presonally I've grown acustom to that setup, and its a great time saver. You can clear by deleting layers... if you want a fresh start, reload the page. Middle click or alt+drag lets you grab the canvas and move it around. right click to select a color on the canvas. it has a little trick where it selects the color and hue based on the transparency of the current layer, and then adds the transparency value AGAIN to the color u just selected, so if you are selecting a color on a near transparent layer and start to draw with that color you will have to manually darked then color you've selected to make it match. you should be able to continue a drawing with the layers you left it with. that is my only gripe. lascaux lags my computer and so i have to reset and continue drawing - but often i have to redraw a large section of my picture because i put my sketch lines in a layer on top of the main drawing. If you read my comment before, this board doesn't save LSD format cause they take up too much space. The large lascaux board has it for test purposes but there are some problems in it atm. Once animation support is complete, that'll save the layers properly. Maybe I just couldn't find the tools... but flip/scale/rotate tools are really helpful. it's not even like you have to make it resample nice, but just something to make things easier. They'll be added eventually...once I figure out how I want to do them. Oh, by the way, a "pan" tool like the little hand-grabby thing would be nice. Great Board! I wish I could have one on my site. Lascuax onwz its cool! and very impressive. Sererena: middle click and drag, or alternatively, alt+click. Lascaux is so much easier 2 draw on because it has so much more, it should have 1 of those smudgy tool thingys though. But I love 2draw so keep up the good work on your site! It's really great. Ummm.... I know you said that the pressure opacity has "improved" on solid brushes, but now.... ick. The way it is now, I can't get it to 100% opacity no matter how hard I press, and it has that gross transparent effect... Myeeehhh put it back the way it was!!!! That's a bug that was there before, just not obvious. I'll fix it in the next version. It's kinda fun to go back and read Marcello's old comments and see how attentive he was to his new baby.